A boy attempted suicide after his obsession with video game Fortnite turned his life into a nightmare. Carl Thompson, 17, spiralled into debt and drug addiction as he spent almost all of his time playing it – including 12-hour stints. He hardly ate or slept and says he was “miserable and unable to function”. Only a few months after first playing the game, he decided there was only one way to escape. He tried to jump to his death from his third-floor bedroom window. By chance, Carl’s dad saw him as he was about to leap and pulled him to safety. The teenager is now having treatment to deal with his issues. Now, he is speaking out in the hope it deters others from following in his footsteps. He says: “Fortnite turned me into a suicidal, thieving, lying drug addict. Fortnite has attracted 125 million players since its launch a year ago. The survival game, played online and on XBox and Nintendo consoles, is for over-12s. It is predicted to make £15billion next year. Meanwhile, figures show more than 5,000 people tried to get help for gaming addictions over the past year, a 167% rise – with 30% of them children. Carl’s mum Carol, 38, says: “I’m petrified how many kids will get addicted to this game this summer. Carl, from Preston, Lancs, previously played addictive games such as Call of Duty, and Grand Theft Auto but found time to study and play sport. But it was different when he started playing Fortnite in November, when he was 16. He says: “The more battles you win, the more you want to keep playing. Carl soon began missing college. He stopped playing sport and stole from his parents to pay for the game’s latest weapons and upgrades. He says: “I was exhausted doing all-nighters, so my mates said I should try playing with amphetamines. I’ve always been anti-drugs, but all I wanted to do was play the game more, and this seemed the only way. “I was doing all-nighters three or four nights a week. When I hadn’t slept, I’d just take more speed and carry on. I was a complete state, miserable and unable to function... kept up by the speed and not eating. Suffering come-downs from the drugs, the only way he knew how to get back up was to take more speed. It all got too much one night in April. He says: “I just had to escape this existence, and the only way I knew how was to kill myself. “I climbed out of my bedroom window and looked down, wanting to end it all. I was shaking and crying. Before I could jump I felt a hand grab my neck and arm and yank me back. “My dad had heard the window opening and came in see to what was going on, and rushed to grab me. Until then, Carl’s parents were oblivious to the dark place their son was in. The game, in which 100 players try to be the last to survive on an island, has millions of young players, and famous fans such as England footballer Dele Alli. Carol says: “We honestly had no idea any of this was going on until the night Carl tried to kill himself. Carl’s parents called in counsellor Steve Pope, and the lad’s life is slowly getting back on track. Carl says: “All I cared about was Fortnite. It’s almost impossible to descr­ibe how quickly it happened, the bubble I was in, how my old life felt like a dream. US firm Epic Games, which created Fortnite, declined to comment. A mum and her ten-year-old son have shared their own experience of how Fortnite has affected their day-to-day lives. "I fibbed to my Mum so I could download the game. I said our friends in France had it - they didn’t. They are the same age as me. She looked it up online because it is a 12. A few sites said that it was ok for younger kids as there wasn’t any blood and the graphics were like minecraft so not like GTA or Black Ops. It isn’t any more violent than Star Wars Battlefront, rated 12, and I’ve played that so eventually she agreed I could download it. Mum would probably say she regrets that! I got it in October 2017 before any of my friends so I didn’t really play it much with them at first. Then everyone got it and it’s all we talked about in the playground. If you know your friend’s gamertag you can play it with them. I used to play Fifa 17 a lot and NBA 2K17 (a bastketball game) which Mum played with me. But I have pretty much stopped playing any other games.. unless Fortnite won’t load or is updating. Sometimes this can take ages and I can get really annoyed. It’s frustrating if you know your friends are playing and you can’t. I have had so many rows with Mum about it. Mum cried once because the argument was so bad. I did call her some horrible names and screamed that I hated her. She says I am addicted to it and we have talked about what this means. I do sort of agree with her because it is all I really want to do when I am at home. And it is all I want to talk about. But it hasn’t stopped me from going to swim training three times a week or to cricket. We have had to agree that Wednesdays is an XBox free day. I hate that. And I still get angry about it. I want to punch something when I get angry and Mum and I have had to talk about that too. I know it's wrong to get so angry but I can't help it. I just want to play Fortnite with my friends! We’ve agreed I can play it a bit later on a Friday night when I get back from swimming. Not as late as some of my friends though who are allowed to play past 10pm. I have to do all my homework first so I like it if I don’t get any as then I can play earlier. I don’t play much at Dad’s at all although I do have a PS4 there. Sometimes Mum gets annoyed because the XBox is in the lounge. She says it is ‘our shared space’ and she feels I take over when I am playing Fortnite. But she won’t let me have the Xbox in my room. Mum has played it but she just hid in a bush the entire time so she did quite well. She was pretty rubbish apart from that and can't remember which button does what. When I am not playing Fortnite, I like to read about it or watch YouTube tips on how to win games, My favourite YouTuber is Ninja. He has more than 2000 wins. I also like Ali A.
I have 10 solo wins 2 duos and 13 squad wins. My friend Alfie is a good person to do duos with. We do really well when we play together. I have probably spent about £250 since October – most of it my Christmas and Birthday money. Or I earn Mum-Bucks by helping round the house. I don’t get pocket money but if I did I would want to spend it on Fortnite. I’ve bought skins, gliders, pick axes and emotes, which are dances. I probably ask for V-Bucks every day, sometimes just to wind Mum up, but also because I do want all the stuff on the game. And there’s new stuff all the time!" You can play it when you’re younger as most shooter games are for 18+. Although the graphics are quite basic, I like it. The fact you do have to spend money getting stuff... it would be good if you could earn V-Bucks by getting better at the game. "I started to hate Fortnite as it became more of a phenomena. At first it was just another game but as it grew more popular, things started to change. It wasn’t the game or the Xbox that I don’t like. It’s what was happening to Ted when he played it. He wasbecoming aggressive and at times having meltdowns when asked to turn it off. This was causing an untold number of rows. I’ve banned play, taken away the headset, limted time, written a contract that both signed, threatened to get rid of the console and even turned it off mid-game once which was a nightmare – screaming and tears from both of us. One row got so bad that I took him to the local coffee shop so we could talk calmly about it all. Neither of us would dare raise our voices in public and it felt a better environment to try and understand what was going on for both of us. I didn’t know for example that one game lasts about 20 mins so we talked about how starting a new game just before dinner wasn’t his best choice. Ted has two homes and doesn’t get to play much game when at his Dad’s. He spends a great deal of time hoofing a ball about instead which is brilliant. He explained he felt left out when he couldn’t play it when he was at his Dad’s and I understand that, so we agreed he could play a bit later on a Friday night and have a longer session on a Saturday. Ted does the 5k Park Run with me every Saturday or has a cricket match so to play on the Xbox when we get back is ok with me! And talking to him has helped. The rows have subsided. They haven’t gone completely but that’s not surprising. He’s 10 and sometimes thinks he has the meanest mum on the planet if I don’t let him have a second biscuit. He’s learning that life is sometimes unfair. We do need to be aware that kids play differently these days. Of course I’d rather he go outside to play but we don’t have a garden and the nearest park is a 15 minute walk involving busy roads so he can’t go alone. And if he is going to play computer games then I’d rather him be chatting to his mates while doing it than playing alone. I feel angry that parents are being blamed (by the likes of Piers Morgan and Lorrine Marer on Good Morning Britain) for not being able to say no. It isn’t always about saying no. Sometimes it is about not being able to say yes. I am a single parent who has to work from home and much as I’d love to spend time with Ted, sometimes I simply can’t – I have to work. And when Ted is at home, done all his homework, been swimming or played cricket then he is entitled to relax and this is the way he wants to do it. Of course I monitor it, I am in the same room as him the entire time he is playing. He is basically on a digital/remote playdate with his friends. A lot of the time he is talking tactics and using a language that is alien to me. Tomato Town and green ARs, legendary bushes and stuff is part of his language. I talk to him about it so I can understand what he is doing. And I check who he is playing with all the time." 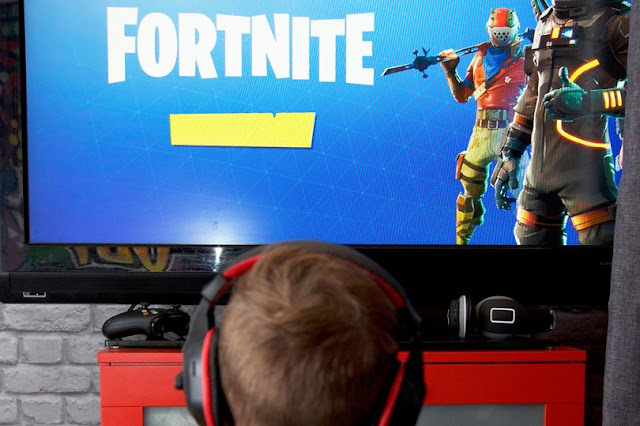 Why do children become ‘addicted’ to games like Fornite? A lot of games are designed to be addictive. Also, kids copy one another. If we were talking 30 years ago you’d be asking why is everyone playing with a Rubik’s cube? One person does it, everyone does it. The appeal is particularly strong for boys, who are programmed to seek competence during young adulthood. These games play on that, they want to be the best, have the best weapons, beat their friends. It’s no wonder to me that kids want to play games like this. What should you do if you think your child is getting addicted? You need to have some sense of proportion. Whether it’s a game, or playing on your phone in general, parents need to parent. They need to be on top of it. Be aware of what your kids are engaging with and set limits. In the same way you vary the kids’ diets, it’s the same psychologically. No child should be doing one activity the whole time. At what point should parents seek professional help? Are there major changes in your child’s behaviour? Are they talking about the game obsessively? Are they playing it for hours on end? Is there a sense they’re staying away from you in their room and staying up late? If they’re staying up late, are basic needs like eating and sleeping being disrupted? There are physical symptoms to look out for, like sore eyes, neck pain, headaches. If they appear preoccupied, or if they seem low that could be a sign. No kid wants to stop doing something if you ask them, but if they get really irritated or aggressive, that’s a warning sign. Visit internetmatters.org for more advice on kids’ online gaming safety. For confidential support, the Samaritans can be contacted for free around the clock 365 days a year on 116 123.